Sydney underwent extensive maintenance during the first quarter of 2000 with a number of outstanding defects being rectified. 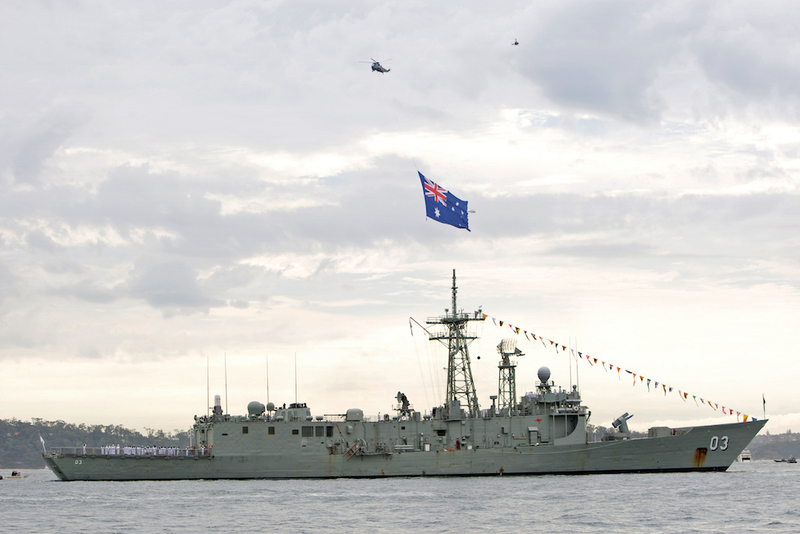 While alongside, members of the ship’s company participated in the INTERFET Welcome Home Parade in Sydney on 19 April, and in the Anzac Day parade. She returned to sea on 15 May to commence shakedown and workup exercises, and visited Melbourne later in the month. She participated in Exercise DAY TOOTHFISH III in June, which was curtailed due to inclement weather, before departing Sydney on 13 June for South East Asia. She arrived in Singapore, via Cairns and Darwin, on 30 June. She participated in Exercise FLYING FISH in July involving 32 ships, 89 aircraft and 5,000 personnel from Australia, the UK, New Zealand, Singapore and Malaysia. 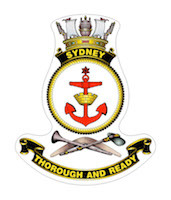 On 7 July, while conducting a personnel transfer with HM Ships Cornwall and Newcastle, Sydney’s sea boat was overturned and two sailors fell overboard. Newcastle recovered the pair and they were returned to Sydney uninjured. Upon the conclusion of FLYING FISH on 18 July, Sydney went on to visit Manila and Cebu in the Philippines before returning to Darwin on 5 August where she participated in the Fleet Concentration Period 00-2. She returned to Sydney, via Townsville, on 23 August and participated in Exercise DAY TOOTHFISH IV. 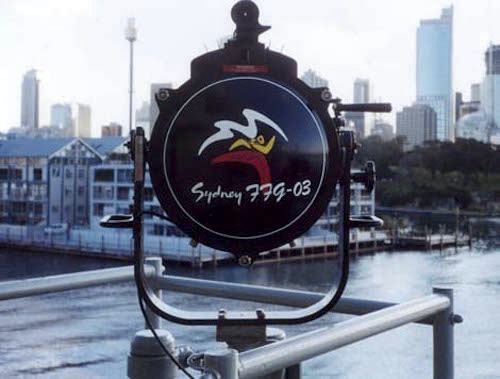 On 8 September Sydney commenced operations in support of Operation GOLD, the Australian Defence Force’s (ADF) support to the Sydney Olympics and Paralympics, acting as Olympic Guardship in Sydney Harbour and conducting presence and surveillance operations off the coast. She departed Sydney on 7 October for the Solomon Islands in support of Operations ORBIT and DORSAL, the ADF operations supporting the peace negotiation process in the Solomons. She anchored off Honiara on 11 October before proceeding to Munda on New Georgia Island on 16 October to embark the delegates who had participated in peace talks in Townsville and returned them to Guadalcanal. She was released from the operation on 28 October. She visited Auckland and Nelson in New Zealand, and Hobart before returning to Sydney on 24 November where she began preparations for a refit which officially commenced in January 2001. She returned to sea on 16 July and visited Geelong later in the month before commencing post-refit trials in August which saw her visit Hobart and Brisbane. 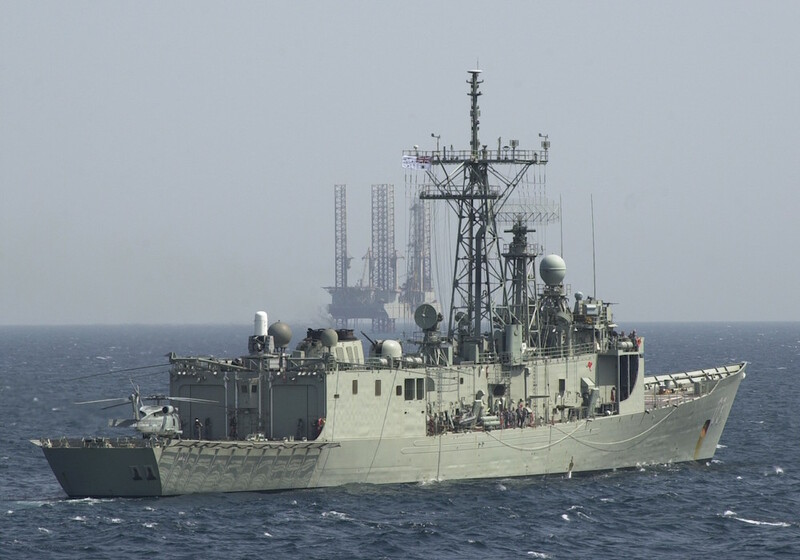 On 11 October Sydney once again deployed to the Arabian Gulf in support of Operation SLIPPER. 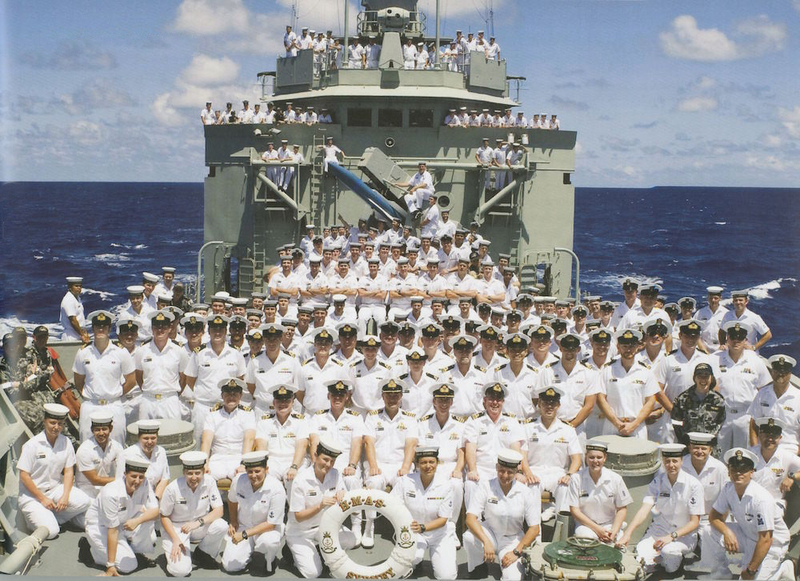 In the wake of the 11 September terrorist attacks in the USA, HMAS Anzac’s deployment to the MEAO, which had been scheduled to end on 16 September, was extended while Sydney worked up to relieve her. Sydney conducted her work up while en route from Sydney to Darwin and departed Darwin for the MEAO on 31 October. She arrived in the MEAO on 9 November when she relieved Anzac, and was joined by HMA Ships Adelaide and Kanimbla on 2 December. While political tensions in the Middle East escalated as a result of the 11 September terrorist attacks, the practical routine for RAN ships in the Gulf remained much the same as before, albeit with a greater emphasis on force protection. Sydney provided two twelve-person boarding parties and, along the boarding parties provided by Adelaide and Kanimbla, was recognised as experts in boarding operations. Their operations were so successful that smugglers began using more desperate passive defensive measures to avoid interception such as covering windows and hatches with steel plating, the removal of access ladders and spreading oil on decks. In spite of this, the Multinational Interception Force’s efforts proved to be highly successful and there was a significant decrease in smuggling activity from January 2002. Sydney departed the MEAO on 20 February 2002 and arrived back in Sydney, via Goa, Phuket, the Cocos Islands, Geraldton, HMAS Stirling and Adelaide, on 28 March where she commenced a leave and maintenance period. Sydney on patrol in the Middle East. Sydney sailed for Darwin on 3 June where she participated in Exercise SINGAROO before conducting Operation RELEX II patrols in the vicinity of Christmas Island in late June and early July. She conducted exercises in northern Australian waters before returning to Sydney on 9 August. She departed for Asian waters in September visiting Manila in the Philippines, Qingdao in China and Nagasaki in Japan before participating in the JMSDF 50th Anniversary Celebrations in Yokusuka and an International Fleet Review in Tokyo on 13 October. She conducted a multinational Search and Rescue exercise en route to Guam on 15 October and, following a visit to Brisbane and a brief period of exercises off Jervis Bay, arrived back in Sydney on 7 November. She began an extensive maintenance period on 12 November. She returned to sea on 4 February 2003 and participated in Exercise TASMANEX later in the month. She departed Sydney on 8 April and arrived in the MEAO, via Fremantle and Diego Garcia, on 29 April just in time for the final phase of Operation FALCONER, the Second Gulf War. Just two days later, on 1 May, US President George W Bush announced that major combat operations in Iraq had ceased. Sydney conducted patrols in the North Arabian Gulf and acted as Guard Ship for the Khawr Abd Allah and Shatt Al Arab involved in surveillance and, when required, interdiction of merchant traffic. She conducted 82 boardings in 82 days and conducted port visits to Bahrain, Mina Jebel Ali in the UAE and Kuwait City. She was relieved in the MEAO by HMAS Newcastle on 2 August and arrived at HMAS Stirling, via Colombo, on 16 August where she began preparations for the FFG Upgrade Program. She continued on to Sydney two days later and arrived on 28 August after visiting Albany, Port Arthur and Hobart en route. Sydney’s FFG Upgrade Program officially commenced on 22 September. The program involved the extensive upgrade of four of the RAN’s Adelaide class frigates which, in Sydney and Darwin’s cases, included an extension of their expected service lives. On 16 August 2004, with the ship alongside Garden Island’s East Wall in Sydney, crew members manned the ship’s rigid hull inflatable boat (RHIB) to offer assistance to HMNZS Endeavour when her lifeboat, fully laden with 22 sailors, plunged 10 metres into the water and capsized. Sydney’s RHIB recovered eight personnel from the water and medical staff provided initial medical treatment to the injured. Fifteen of Endeavour’s crew were injured in the incident. Sydney returned to sea on 9 December and commenced initial sea trials of her new systems the following day. The FFG Upgrade Program continued over the ensuing months as the ship continued to install, integrate and trial new systems. She returned to dry-dock in the Captain Cook Graving Dock in April 2005 to rectify hull defects and perform other maintenance. She returned to the water on 31 August and re-commenced Upgrade Program trials. Sydney participated in Exercises OCEAN PROTECTOR 06 and TASMANEX 06 in February 2006 while conducting sea acceptance trials marking the first time that the FFG Upgrade Program capability had been integrated into a force environment. She also conducted a port visit to Hobart for the Royal Hobart Regatta that month, visited Albany and Fremantle while continuing trials in Western Australian waters, and returned to Sydney in time for Easter. Sydney conducting officer-of-the-watch manoeuvres in company with HMA Ships Stuart, Warramunga, Yarra and Gascoyne during Exercise Ocean Protector. On 28 April 2006, Sydney was formally ‘handed back’ to the RAN by the FFG Upgrade Program contractor, ADI Ltd, in a ceremony conducted in Sydney and continued to undertake extensive trials for the remainder of the year before being formally provisionally accepted on 15 December. Provisional acceptance meant that the RAN could commence operational testing and evaluation of Sydney’s new capabilities. Sydney visited Brisbane in June and Melbourne in July before deploying to New Zealand, via Hobart, in August and September where she conducted exercises with RNZN and RNZAF units. She returned to the Captain Cook Graving Dock both to progress rectification of defects related to the Upgrade Program, and to conduct extensive maintenance unrelated to the Program. She returned to sea on 13 March 2007. She conducted exercises and training in Western Australian waters in early April before returning to Sydney on the 17th. She received further software upgrades through June and July and, on 20 August, achieved an important milestone in the FFG Upgrade Program when she conducted a world-first firing of an Evolved Sea Sparrow Missile from an FFG. The missile scored a direct hit against a Kalkara unmanned airborne target. Sydney firing an Evolved Sea Sparrow Missile. On 14 September, Sydney hosted the Sydney Infants’ Home annual fundraising cocktail party ahead of deploying for the Pacific and North America on 17 September. She arrived at Pearl Harbor, Hawaii, via Apia, Samoa, on 1 October and on 14 October successfully fired four Evolved Sea Sparrow Missiles in the Barking Sands Pacific Missile Range Facility demonstrating the integration of the ship’s new combat system software and vertical launch system. She departed Hawaii for Vancouver, Canada, later that day and arrived five days later having avoided a string of severe storms emanating from the Bering Sea. Sydney spent much of October and November in the Canadian Forces Maritime Experimental Test Range in Nanoose Bay conducting trials of underwater systems, and conducted a two-day visit to her birthplace, Seattle, Washington, on 27 to 29 October. She went on to visit San Francisco, where Australian astrophysicist, Dr Helen Quinn, PhD, was presented with her Order of Australia award on board, and Victoria, Canada, where a detachment of the ship’s company participated in the city’s Remembrance Day March, before setting course for home via San Diego, Pearl Harbor and Samoa, and arrived back in Sydney on 20 December 2007 where she commenced a normal programme of training, exercises and maintenance. Sydney visited Adelaide in May 2008 and in November she was in Western Australian waters to conduct a memorial over the wreck of HMAS Sydney (II), lost with all hands 67 earlier in an encounter with the German raider, SMS Kormoran. 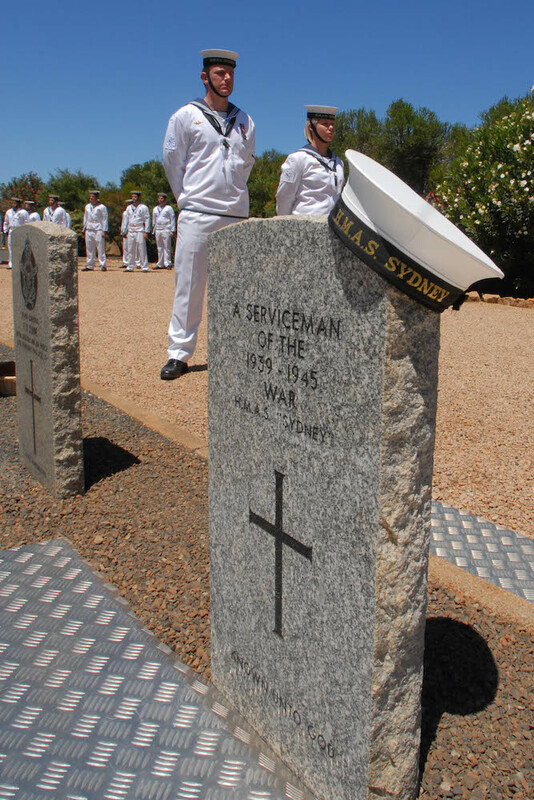 Top: HMAS Sydney IV sailors at the Geraldton War Cemetery with the headstone of the unknown serviceman. 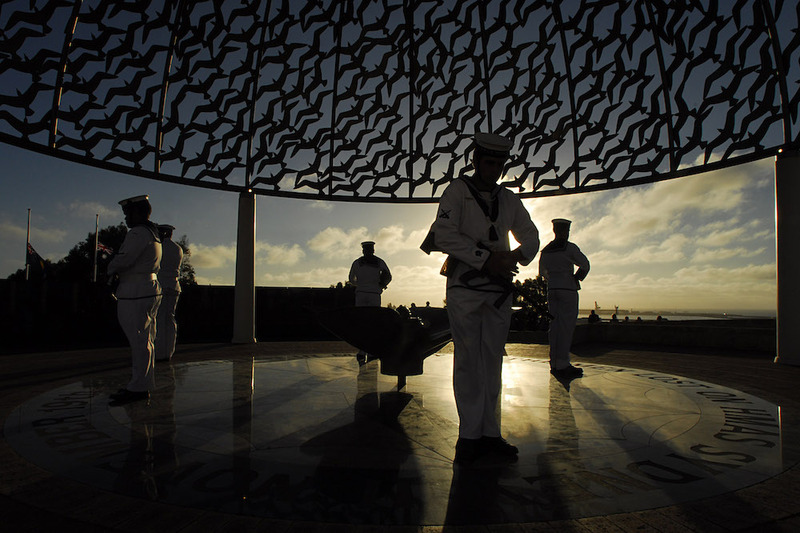 Bottom: Members of HMAS Sydney's crew form a Catafalque Party under the Dome of Souls at sunset at the HMAS Sydney II Memorial in Geraldton, Western Australia. She participated in the Fleet Concentration Period in February and March 2009 at the conclusion of which she led sixteen other vessels into Sydney Harbour on 13 March for a ceremonial Fleet Review. The following day, the ship’s company participated in a Freedom of Entry march through the City of Sydney. A Sea King helicopter from 817 Squadron flying the Australian National Flag over HMAS Sydney during the Royal Australian Navy's Fleet Review in 2009. On 23 April, delayed by three days due to a defect in a gas turbine, Sydney departed Sydney for Northern Trident 09, a six-month, round-the-world voyage supporting international maritime security and conducting exercises with foreign navies. She visited Eden on the New South Wales south coast, Cairns and Darwin where she rendezvoused with HMAS Ballarat, before the two ships set course for Kochi, India on 30 April. 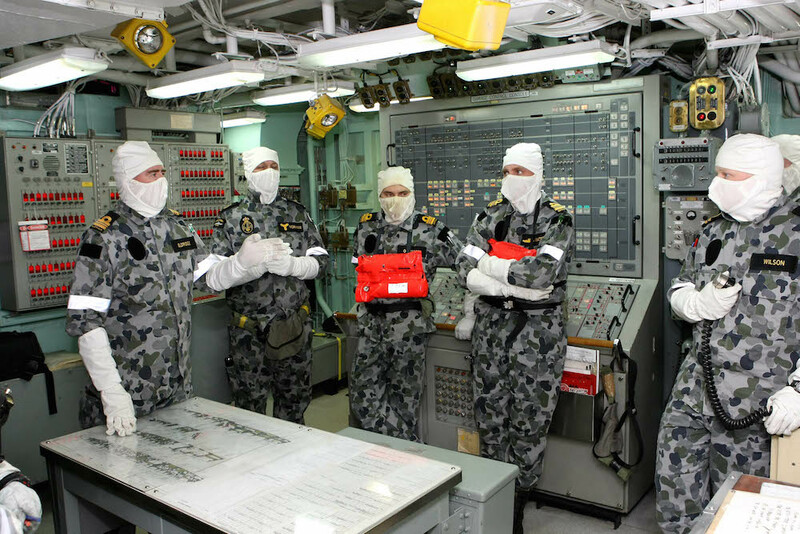 HMAS Sydney's crew during her Northern Trident deployment in 2009. Following a successful three-day visit to Kochi, Sydney and Ballarat set course for the Red Sea and the Suez Canal. On 17 May, while crossing the Gulf of Aden, the ships received a distress call from MV Dubai Princess, some 20nm ahead of Sydney and Ballarat, which reported that she was under attack from pirates. The two ships arrived on the scene to find Dubai Princess being harassed by two pirate skiffs, which broke off their attack when the Australian warships arrived. However, soon afterwards a second vessel, MV Stellar, 6nm astern, reported that she too was under attack by pirates. Ballarat detached to assist Stellar while Sydney remained with Dubai Princess to affect a handover to USS New Orleans later in the day. With New Orleans assuming responsibility for the situation, Sydney resumed passage towards the Suez Canal and rendezvoused with Ballarat the following day. Lieutenant Commander Griffyd Eldridge briefs his damage control team during an exercise while on passage during Northern Trident 2009. 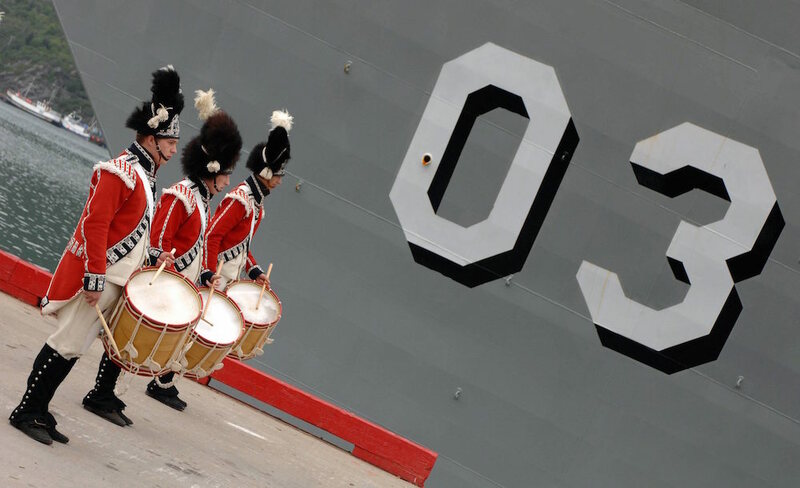 The Royal Newfoundland Regiment (Signal Hill Tattoo) from the Queen's Battery welcomed HMA Ships Sydney and Ballarat with a fife and drum band performance and drill demonstration at the Freedom of the Seaport ceremony in St John's, Newfoundland, during Northern Trident 2009. 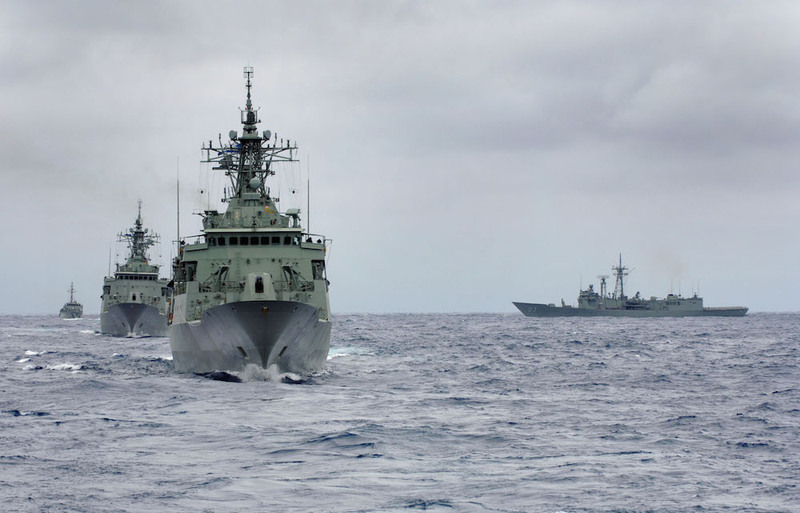 Both ships conducted exercises with Canadian and US naval units during the North American leg of the deployment in July and August, and conducted port visits to Halifax, New York, Baltimore, Norfolk, Jacksonville, Nassau and, after passing through the Panama Canal, San Diego. Sydney also contributed to the Joint Inter-Agency Task Force - South, a multi-agency counter-narcotics organisation, off the US east coast. Both ships departed San Diego on 24 August and visited Pearl Harbor where they parted company; Ballarat bound for Japan while Sydney continued on to Apia, Samoa. She arrived back in Sydney, via Eden and Jervis Bay, on 19 September having travelled 32,943nm and visited 21 ports in 10 countries during Northern Trident 09. She began preparations for a refit upon her return. 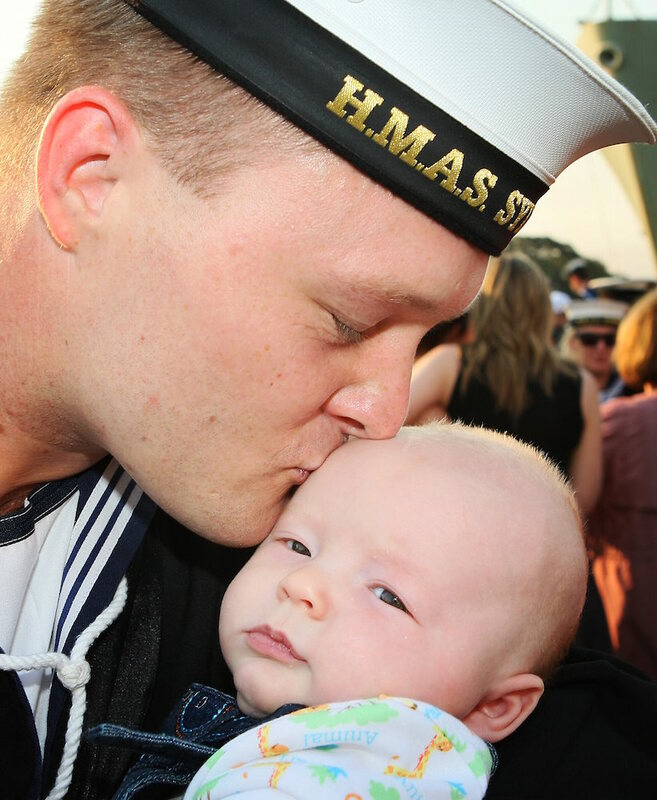 Able Seaman Mathew Avery with his 14-week old son Riley, at the welcome home ceremony for HMAS Sydney in Sydney after five months away on NORTHERN TRIDENT.